By Neil Gaiman and Chris Riddell, published by Bloomsbury. Goodreads Synopsis: You know what it’s like when your mum goes away on a business trip and Dad’s in charge. She leaves a really, really long list of what he’s got to do. And the most important thing is DON’T FORGET TO GET THE MILK. Unfortunately, Dad forgets. So the next morning, before breakfast, he has to go to the corner shop, and this is the story of why it takes him a very, very long time to get back. My Review: One of the only picture books I’ve read this year, but possibly the best picture book that I’ve ever read! Fortunately, The Milk is an epic tale, and though it was aimed at children, I at thirteen enjoyed it so much. This’ll be a shorter review than most of my reviews, as the book is pretty short itself! Neil Gaiman’s used his incredible imagination, to create a really wild, crazy adventure that I easily let myself get absorbed in for half an hour. Who would’ve thought anyone could’ve pulled off a book with Dinosaurs, Wumpires (Think Vampires… but, uh, Wumpier. ), Pirates, Milk, ancient Tribes, and time travel… in one book? Well, it’s possible. This book was just brilliant. The book started on a pretty crazy morning family scene- Mum trying to get out of the door, dad trying to read his paper, and the kids upset because cereal doesn’t taste that good without milk. Then, after Dad’s back from the shop, he spins a story about why he took so long- with the two inquisitive children occasionally butting in with questions. It was all pretty hilarious, I think. There’s also quite a good outcome to the story too, that proves Dad’s story to be wrong or right. It’s really funny- and made me giggle a bit! Chris Riddell’s illustrations went with Gaiman’s writing perfectly. They were lively, fun, and brought life to the story. I think if you’d have picked any other illustrator for the job, it wouldn’t have looked as brilliant. I’m a big fan of Chris Riddell’s drawings, and I just fell in love with his work for this book… especially the front cover! Isn’t it just so vibrant- so pretty? Also, I’m pretty sure this is intended, but the Dad looks suspiciously like Neil Gaiman. If it was an intended thing- then it’s a great likeness. Overall, Fortunately, The Milk was a brilliant story from start to finish. It’s the kind of one you’ll want to read over and over again, whether you’re a child or an adult or in between. 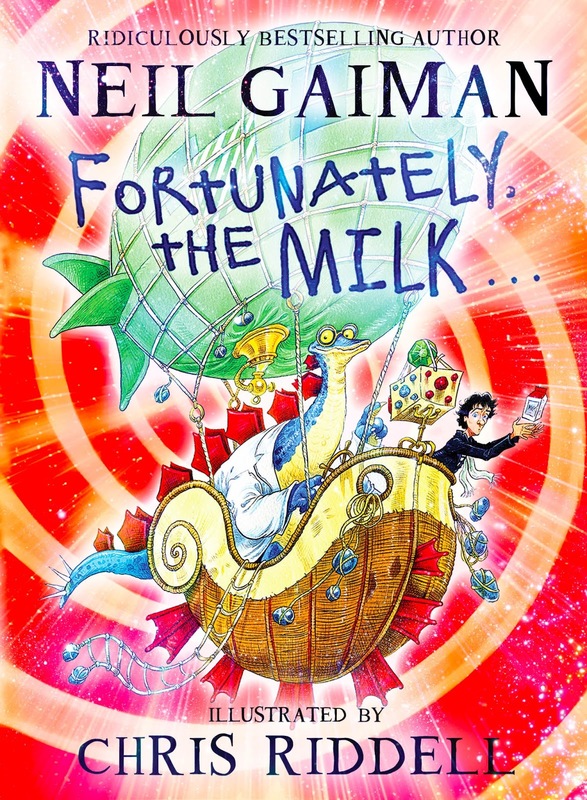 I loved the original concept, and Neil Gaiman’s ability to turn a normal trip to the store for milk into an epic, sci-fi fantasy adventure is admirable. Chris Riddell’s illustrations brought every character, no matter how briefly mentioned, to life, and I’ll definitely read this again sometime when I’m looking for a laugh or a short adventure! I received a copy of Fortunately, The Milk from the publisher, via Netgalley, in exchange for a review. In no way at all did this affect my thoughts. This entry was posted in Uncategorized and tagged adventure, fantasy, picture-book, sci-fi on August 28, 2013 by keithbwalters. This book just sounds like so much fun. Ah, it really was! 🙂 Thanks for commenting.